Start på et uforglemmeligt Outback-eventyr på denne overnatningsrejse fra Darwin til Kakadu National Park, et UNESCO World Heritage Site. Gå croc-spotting på en guidet krydstogt ned østlige Alligator River og Yellow Water Billabong, og tag i dramatiske synspunkter af de vildmark rige vådområder. Lær om lokale oprindelige traditioner fra en aboriginal guide, når du besøger fællesskabet af Arnhem Land og beundrer den gamle rockekunst på Ubirr. Vælg fra forskellige niveauer af indkvartering, der passer til ethvert budget. I have rated this tour as 4 only due to the hotel accommodation that I chose - The Aurora. The tour was inspiring with so much to view and experience. 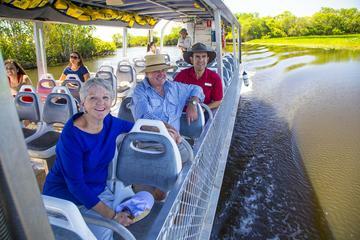 I would recommend it for anyone thinking about visiting Kakadu. It is certainly a comprehensive way in which to see the area, especially when the tour guide, Narelle was so informative, interesting and certainly knew how to put people at ease. However, the Hotel Aurora was tired, the air-conditioning took nearly three hours to moderately cool the room, the pool area at night was not adequately lit to take a swim. Being aware of the humidity and heat conditions, the air-conditioning unit should have been switched on prior to arrivals. This at least would have given some respite to hot and tired guests. Whilst it was clean and adequate, it was disappointing. The room charge was similar to the Crocodile Resort Hotel which is where I would advise people to stay. Great tour of amazing area and culture. The driver/guide Ben was very well informed and entertaining in his commentaries. Coach was comfortable.